Pen Drives are very useful portable storage devices which helps us to transfer data from one computer to other at different place. Storage capacities of pen drives or usb flash drives have increased to a great extent over the few years. Also some of the pendrives available in the market are so compact that they are smaller than the USB connector itself. Most of the people do not care about their pendrive and they just treat it casually but you if want your pendrive to last longer and also for your data to be intact then you must take proper care of your pendrive. So here I will be sharing some useful tips to keep your pendrive in good shape and condition. Here are some very useful tips that can extend the life of your pendrive and increases its performance. The first and foremost thing to do is keep the pendrive cover or cap plugged in when you are not using it. Nowadays some pendrives does not come with cap so in this case you must be very careful and keep the USB connector protected all the time. Always try to keep your pendrive away from malware and viruses. Viruses can cause damage to your pendrive by replicating itself and causing high amount read/write operations. It can also cause damage to your files and also the files of the computer on which you are going to attach your pendrive. If you have got infected then to remove malware and viruses from your pendrive you can use Eset NOD32 antivirus which is the best antivirus around. I have seen that many people have this habit of formatting their pendrive every then now. Doing Format again and again may reduce the lifespan of your pendrive as it has limited write cycles. So I advice you not to format your pendrive unless it has been infected by a virus or you have to delete huge number of files or data from it. Format your pendrive with exFAT file system for better performance and space utilization. exFAT (Extended File Allocation Table) is a file system from Microsoft which is designed especially for pendrives or usb flash drives. The problem of using NTFS file system on pendrives is that it has a huge cluster overhead and your files will occupy more space on your usb pendrive or flash drive. exFAT is very well optimized for pendrives / flash drives and its maximum file size limit is 16EB (Exabyte), which is very huge. 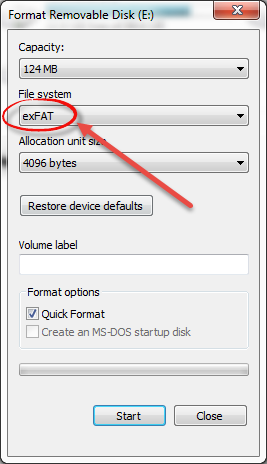 To format a pendrive with exFAT file system right click on your pendrive drive in my computer and then go to->format and select exFAT as file system, and then click on start to format it. Don’t just throw your pendrive anywhere in your room. Take proper care of it and store in cool place and away from any magnetic and electronic devices or interference.